Iveta Mukuchyan (Իվետա Մուկուչյան) was born on 14 October 1986 in Armenia. Her father was an engineer in Armenia, her mother was an interpreter. In 1992, when she was 5 years old, her family moved to Germany, where she attended primary school and Catholic Sankt-Ansgar-Schule in Hamburg. Iveta started singing at the age of 3 and doing music at the age of 12, self-writing songs, and then performing them with a guitar or percussion players. However, she never thought about singing career and after high school she began to study design. "In college I studied linguistics and was supposed to major in that field, but soon I realized that music was my one true passion". It was her parents that persuaded her to return to the music and to move to Armenia for the music studies there, as it was cheaper than in Germany. After living there for 17 years, she returned to Armenia in 2009. Mukuchyan started studying jazz-vocal at the Yerevan Komitas State Conservatory. In Armenia Mukuchyan participated in the fourth season of "Hay Superstar" (Armenian version of Pop Idol) song contest in 2010. She came in fifth place. Was awarded as "Breakthrough of the year" in 2012 in the annual "Armenia" Music Contest. "I was the European woman that has left Europe behind and returned to her roots. I've grown from day one in the eyes of the people. Whether I did rock, or then Dubstep, everything was greatly accepted by the people. The Armenians are the reason why I decided to really follow through and to try to be a good singer"
In 2012 she participated on the second season of "The Voice of Germany" song contest auditioning with Loreen's Eurovision winner "Euphoria". She calls Loreen as her idol saying there can't be more stronger concept at Eurovision, and that she was an only possible perfect match to the song. She was chosen by Xavier Naidoo, who almost got to be competing at Eurovision 2016 for Germany, to be part of his team. Mukuchyan passed the battles round with "Many Rivers to Cross" and reached live shows, where she was eliminated in knock-outs after performing "More" of Usher. Currently she divides time between Yerevan and Hamburg being engaged in show-biz in both cities. In December 2012, she was named the 'most desirable' Armenian female by "El Style" magazine. In the same year Mukuchyan was featured in record producer Lazzaro's single "Freak", followed by appearance on his single "Summer Rain" in 2014. As solo artist she has released two singles: "Right Way to Love" in 2012 and "Simple Like a Flower" in 2015. More songs of Iveta, who is yet to release her debut album, can be heard of her Youtube channel. Today, Iveta is a well-known and loved singer/songwriter not only in Armenia, but also in Europe. She is a role model for many young women, an eye-catcher on every stage and a dynamic artist. Iveta is friends with previous Eurovision entrant Aram Mp3 and they are doing a lot of songwriting together. Lilit Navasardyan, who wrote his ESC song, is also a good friend and writes for her. Among own Iveta music preferences are Motown, Janis Joplin, Tina Turner, Lauryn Hill, Erykah Badu. "I'm very happy, thankful and honored to be chosen by the Public TV Company of Armenia to represent Armenia in Eurovision 2016. I love Eurovision and it's amazing to get a chance to represent my country on the big stage. I've been watching the Eurovision Song Contest since I was a kid and I always wanted to be a part of this big family. I dreamed of the day when I'll be standing on the big stage and doing what I love - singing. It's a great honour to be chosen to represent my country in my own way, through music and art. Your support is very important to me, so I hope you will be next to me on this responsible and important journey"
At the competition Iveta will perform "LoveWave", a song written by Lilith Navasardyan and Levon Navasardyan on the lyrics of Iveta Mukuchyan herself and German singer and Iveta's partner in JCB cover band Stephanie Crutchfield. The premiere of the song and music video took place on 2 March on the First Channel of AMPTV. The song is the reflection of Iveta's inner world and personal emotions: "Love changes people and their inner world, just like a "love wave" - the first wave of the earthquake - changes the structure of the Earth". As most interesting things about her entry, Iveta cites that it is experimental and unique and is based on pure and real emotions, however adds it was a risky choice to put the so-called "Eurovision standards" aside and come up with something entirely different. "But it was sure worth it". Armenia became the fourth country, which is collaborating this year on Eurovision staging with Swedish stage director and choreographer Sacha Jean-Baptiste. We remind that besides Armenia Jean-Baptiste is also involved in preparations of entries of Georgia, Cyprus and Lithuania. Popularity of Jean-Baptiste rose significantly after her successful work with the representative of Georgia last year, Nina Sublatti. Prior to this, at the Eurovision Song Contest she has also worked with the representative of Russia in 2011 Alexei Vorobyov. She can also boast with number of performances she prepared for the Swedish national selection Melodifestivalen. The line-up of backing vocalists of Iveta Mukuchyan will include songwriter of LoveWave Lilith Navasardyan, former Junior Eurovision Song Contest contestants Masha Mnjoyan (backing vocalist in JESC 2008 and national final participant of the same year, as well as participant of New Wave 2013) and Sona Gyulkhasyan (national preselections of 2010 and 2011 and New Wave Junior 2012), as well as Anushik Ter-Ghukasyan and Christina Mangasaryan. While talking about the selection process for the backing vocals, Lilith Navasardyan thanked the participants and said that it was very hard to find the perfect match, as some parts of the song were very challenging for most singers. "LoveWave is very experimental and that's what I love about it. This wave is taking all of us out of space and time, making us come alive. I'm confident that our song will excite both the audience and the juries" – says singer Anushik Ter-Ghukasyan. Masha Mnjoyan said she was very excited when she first heard LoveWave, as it was something completely different, adding: "LoveWave is such a powerful song. And Iveta is fabulous. I can't wait to see what our team will come up with for the staging". "I like how this song is both modern and ethnic at the same time. I just love how modern beats blend in with traditional Armenian tunes. And the instrumental part is incredible. I never thought that Armenian zurna could sound so melodiously" – says Christina Mangasaryan. Sona Gyulkhasyan added that she had only one word when she first heard the song. "I was very excited with AMPTV's choice to send Iveta to Eurovision. I was really waiting for the song premiere, and as soon as I heard it, I had only one word in mind… WOW!". "We have had songs submitted from all over the world, Sweden, UK, Germany and United States... It was incredibly hard, but in the end, we just shortlisted 2 songs. The reason why LoveWave won is because it has so deeply touched emotions of all of us"
Gasparyan marks this year remarkable for Armenia in Eurovision Song Contest in terms of preparatory achievements within the broadcaster. "We, most definitely, are raising the bar by working with best professionals from all around the world with us. Our domestic music video director Aramayis at AMPTV have collaborated with German production company BlackSheep communication on creating an immersive music video experience" – says Gasparyan. LoveWave has been commented as one of the most incredibly edited videos at this year’s Eurovision Song Contest. "We would like to also highlight in hard-working collaboration from our project managers, from Germany and United Kingdom. We would like to thank our UK based Armenian project manager Martin Muradyan who so professionally supported us on the international tour and brought us closer to UK and Europe in order to ensure we do our best at the competition. We are all working on something extraordinary next month in Stockholm. Don't miss out!" Muradyan previously worked on Junior Eurovision Song Contests 2014 and 2015 for AMPTV as a project developer, making Armenia successfully rise to 2nd and 3rd positions in the respective contests. As for Armenia being bookmakers’ favourite, Gasparyan comments: "We don’t want to predict anything, but we are very honoured to be in the top 5 favourites to win Eurovision Song Contest 2016". Today AMPTV has revealed some details and backstage photos from Armenia's postcard for Eurovision 2016. This year the postcards will present the artist and the country, while highlighting both country's traditions and artist's hobbies and interests. This year's concept is very unique. We are trying to present the country through the artist – his hobbies, interests, etc. We are using various shots to make the postcards even more beautiful" – says director Oliver Martin – "And we're having a great time in Armenia. The capital is very beautiful, people are kind and very hospitable. And it's a pleasure to work with Iveta. She's very creative and professional. I think the postcard is going to look great". You can see the backstage material in the Eurovision diary. The official lyric video for Armenia's entry song "LoveWave" is now available on Iveta's official YouTube channel. "LoveWave" was created by Lilith Navasardyan and Levon Navasardyan. The lyrics were written by Iveta Mukuchyan and Stephanie Crutchfield. "We received more than 300 songs for the contest. I've personally wrote 4 of them. But as soon as I heard this one, I knew that was it. There was absolutely no doubt. The melody reminded me of waves – big, beautiful and powerful. It grows becoming bigger and bigger to finally explode and calm down in a single moment, preparing to rise again. In the first part of the lyrics there is a sentence that I think describes this song the best: "It's like I've stepped out of space and time and come alive"
Co-writer Stephanie Crutchfield says: - "It was very challenging to come up with lyrics to such an extraordinary song. And that's what inspired me and Iveta. We didn't want to do something standard that everybody would expect. Iveta gave the idea of "LoveWave", which by the way is a real scientific term that describes the first wave of an earthquake. We liked the idea so much that it instantly became the core concept of the song. The lyrics are trying to make people realize, that every single person and every single moment matters. Each moment can make a difference. 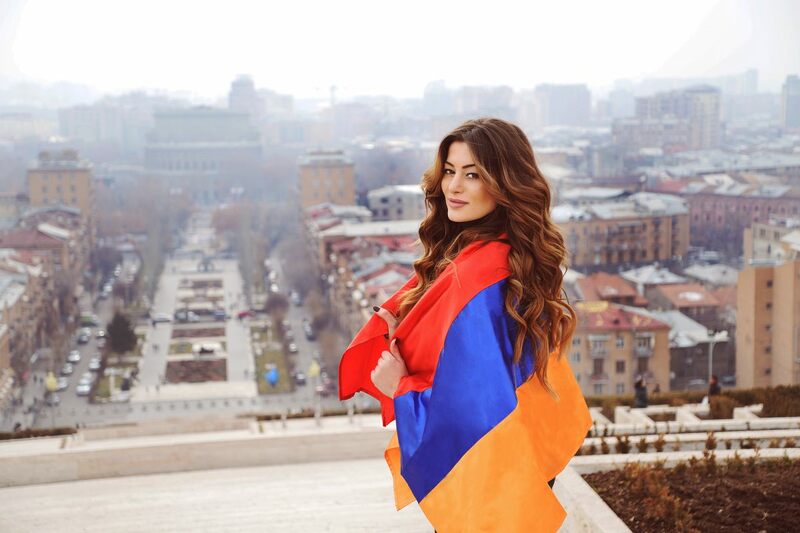 Our strongest influence and weapon to make changes for the good is and always will be - love"
Iveta Mukuchyan will represent Armenia in Eurovision 2016, with her deeply emotional song "LoveWave". It is bases on Iveta's inner world struggles and personal emotions. The song has premièred tonight on www.eurovision.tv. The music video is artistically abstract. We see emotions instead of actions, through a nonscripted scenario the struggling inner world of the characters is revealed. Custom made macro shoots are used to "picture" the chemistry behind this feelings that spread through the whole body. The music video is a result of a co-production between AMPTV and German "BLACKSHEEP communications". It features Iveta Mukuchyan and Swedish top model Ben Dahlhaus, who is based in Germany and is most famous for his work with world leading fashion brands. The authentic looks used in the music video were created by Arevik Simonyan, the founder and chief designer of "Kivera Naynomis". Throughout Eurovision 2016 Iveta Mukuchyan will partner with famous Armenian fashion house - "Kivera Naynomis". Iveta's fabulous costumes will be created by Arevik Simonyan, the founder and chief designer of "Kivera Naynomis". "Kivera Naynomis" will create Iveta's stage costumes, as well as several custom made outfits for official ceremonies and events. They have already created a whole collection of clothes made specifically for Iveta, that were used in the official music video of "LoveWave" - Iveta's entry song for Eurovision 2016. This is not the first time that Iveta works with "Kivera Naynomis". Back in 2013 Iveta was one of the presenters of Kivera's "Red collection". Founder and chief designer Arevik Simonyan says she is delighted to partner with Iveta. "Iveta is the true representation of our brand values: strong, feminine, beautiful. She is charismatic, talented and is field with positive energy. I'm truly delighted to work with Iveta. She's a great artist and an amazing human being" - says Arevik. Iveta's official music video "LoveWave" will be revealed on March 2. Iveta Mukuchyan, Armenian representative in "Eurovision-2016", has attended Polo Ralph Lauren presentation at New York Fashion Week. On 25 September Armenian broadcaster has announced confirmation of Eurovision participation and published a 'mysterious' teaser clip inviting to tune in for the artist presentation hinting on the chosen solo female singer. The question of the artist featured in the clip has been discussed for the long time, but it was later revealed that the video featured not the singer herself, but the head of delegation of Armenia Gohar Gasparyan. Armenian entrant for the Europe's favorite TV show was revealed on October 13 at 19:15 local time during the "Profession of a journalist" TV show. On the same day Public TV Company of Armenia announced a contest for songwriters inviting to submit their work to selection@armtv.com no later than November 13. "A song will be in English, mid tempo to up-tempo, so no ballad. We believe that people want to see a positive performance. Nothing dark or black should come from the styling, from the performance, from the song or lyrics. We want to take course, for example, from Polina Gagarina with her ​​"A Million Voices" and bring a song that will put a smile on people's face when they will be watching. The most important for me is to give an unforgettable performance. I want to give a small piece of my inner world to the people. That is much more important than winning"
On 2 November Iveta has posted a poll, asking fans to help in selection of the preferred genre for her Eurovision entry. In one month, over 400 people have chosen Pop option, while 260 people went for R&B and 85 for Rock. "You all know that it's not enough for me to represent myself and my country "just" with a good song! The brainstorming,concept-ideas and songwriting of the last months as well as the songs that we received,sound very promising for the ESC! I can finally sleep with a smile on my face! From Armenia to USA, Norway to Germany, Sweden to the Emirates...we built beautiful bridges so far and I'm thankful for all the great energy and international communication! The result of this whole process can only be Love that I'm gonna keep and grow inside of me until I am allowed to share it with the world from the ESC stage! So don't worry guys :) we have everything under great control to present Armenia from it's best side and I am more than excited to share it with all of you!" In early December Armenian Television declared receiving about 300 entries from Armenia, Sweden, Germany, USA, Canada, Belgium, Russia, Romania and other countries. At the same time, most of the entries have been received from Sweden, and at the same time Armenian own composers were not very active. "We will make a selection of the entry by the new year, and will make an announcement on that issue", said in the interview to news.am head of delegation Gohar Gasparyan. "Iveta will also appear at the New Year show of ArmTV, and we're planning to make a really beautiful staging of her performance, depending on the song she will be singing there, we're preparing a surprise", added Gohar. On 31 December in Eurovision.tv interview Iveta Mukuchyan has confirmed her entry was chosen. "We received songs from Canada, the United States, Sweden, Armenia, Germany - almost everywhere! We had amazing songs and it was really hard to decide which one to choose". In the end, the choice was narrowed down to just two songs - one from Sweden, and one from Armenia. So what was the winning combination? "The one we chose touched me deep inside my heart. I didn't even know that a song could touch me like that", she explains. "It's going to be a double surprise because we will reveal the song and the music video at the same time". In the New Year show on Armenian PTV Iveta has performed "Diamonds are a girl's best friend". On 19 February it was announced that the song "LoveWave", written by Lilit Navasardyan, Levon Navasardyan, Iveta Mukuchyan and Stephanie Crutchfield has been chosen for competition. Ивета Мукучян (Իվետա Մուկուչյան) родилась 14 октября 1986 года в Армении. Ее отец был инженером, а мать - переводчицей. В 1992 году, когда ей было всего 5 лет, семья переехала на постоянное местожительство в Германию, где Ивета посещала начальную школу, а затем католическую школу им. Св. Ансгара в Гамбурге. Ивета начала петь с трех лет, а серьезно заниматься музыкой с 12 лет, сама писала песни, а затем исполняла их в сопровождении гитары или перкуссии. Однако, она никогда не задумывалась о певческой карьере, и после окончания школы начала изучать дизайн. "В колледже я изучала лингвистику и планировалось, что я серьезно займусь этой сферой, но я поняла, что музыка - моя единственная страсть". Родители убедили ее вернуться к музыке и переехать в Армению, чтобы получить там музыкальное образование, которое обошлось бы дешевле, чем в Германии. После 17 лет проживания в Германии, в 2009 году она возвращается на родину и начинает заниматься джазовым вокалом в Ереванской Государственной Консерватории им. Комитаса. В Армении Мукучян принимает участие в четвертом сезоне шоу "Hay Superstar" (армянской версии Pop Idol) в 2010 году, где занимает пятое место. На ежегодном музыкальном конкурсе "Армения" она получает приз как "Прорыв года". "Я была европейской женщиной, которая покинула Европу и вернулась к своим корням. С первого же дня я начала расти в глазах народа. Что бы я ни пела, рок, потом дабстеп, зрители воспринимали это с большим восторгом. Армяне - это именно та причина, почему я решила сконцентрироваться на музыке и постараться стать хорошей певицей"
В 2012 году Ивета принимает участие во втором сезоне шоу "Голос Германии", пройдя прослушивание с песней Лорен "Euphoria". Она называет шведскую певицу Лорен своим кумиром, говоря, что на Евровидении еще никогда не было более сильной концепции, и что она была единственным артистом, абсолютно точно совпавшим с песней. Мукучян была выбрана Ксавье Найду, который сам едва не попал на Евровидение 2016, в его команду. Через раунд баттлов она прошла с песней "Many Rivers to Cross" и достигла живых шоу, где выбыла в нокаут раунде после исполнения песни Ашера "More". В настоящее время певица проводит время как в Ереване, так и в Гамбурге, занимаясь музыкальными проектами в обоих городах. В декабре 2012 года, журналом "El Style" она была названа "самой желанной" армянской женщиной. В том же году, Мукучян приняла участие в записи сингла продюсера Lazzaro "Freak", вместе с которым они выпустили и еще один трек "Summer Rain" в 2014 году. Как соло-исполнительница она выпустила два сингла: "Right Way to Love" в 2012 и "Simple Like a Flower" в 2015. Другие песни Иветы, которая готовит свой дебютный альбом, можно услышать на ее канале Youtube. Сегодня, Ивета Мукучян является известной и любимой певицей и автором песен не только в Армении, но и в Европе. Она - пример для многих молодых женщин, способная показать яркое зрелище на любой сцене, и динамично развивающаяся исполнительница. Ивета дружит с участником Евровидения 2014 Арамом MP3 и они вместе часто пишут песни. Лилит Навасардян, которая написала его конкурсную песню, также хорошая подруга, и пишет песни для Иветы. Среди личных музыкальных предпочтений Иветы: Motown, Дженис Джоплин, Тина Тернет, Лорин Хилл и Эрика Баду. "Я очень рада, благодарна и польщена тому, что была выбрана Общественным телевидением Армении для того, чтобы представить Армению на Евровидении 2016. Я люблю конкурс Евровидение, и для меня потрясающе иметь возможность представить свою страну на подобной большой сцене. Я смотрела его с детства и всегда мечтала стать частью этой огромной семьи. Я мечтала о дне, когда я буду стоять на этой большой сцене и делать то, что я люблю больше всего - петь. Для меня большая честь быть выбранной для того, чтобы представить свою страну посредством музыки и искусства. Ваша поддержка очень важна для меня, потому я надеюсь, что вы все будете рядом со мной в этом ответственном и важном деле"
Ивета Мукучян исполнит на конкурсе песню LoveWave, авторами которй стали Лилит и Левон Навасардян, текст - самой исполнительницы и ее коллеги по кавер-группе JCB из Берлина Стефани Кратчфилд. "Любовь изменяет людей и их внутренний мир, также как Волна Лява (на английском - Love Wave, что также можно перевести как "волна любви") - первая волна землетрясения - изменяет структуру Земли", объясняет певица идею песни. Премьера песни прошла 2го марта на Телевидении Армении. В качестве наиболее интересных вещей о своей песне Ивета называет то, что она экспериментальная и уникальная, а также основана на чистых и настоящих эмоциях, в то же время добавляя, что это было достаточно рискованным выбором, отложить в сторону т.н. "стандарты Евровидения", и создать нечто совершенно иное. "Но, несомненно, оно того стоило". Армения стала четвертой страной, номер которой в этом году будет ставить шведский режиссер-постановщик и хореограф Саша Жан-Баптист. Напомним, что помимо Армении Жан-Баптист уже работает в этом году над постановками Грузии, Кипра и Литвы. Популярность Жан-Баптист резко выросла после ее успешной работы с представительницей Грузии прошлого года Ниной Сублатти. До этого на Евровидении она работала также с представителем России 2011 Алексеем Воробьевым. На ее счету также многочисленные номера на шведском национальным отборе Мелодифестивален. В состав бэк-вокальной команды Иветы войдут автор песни Лилит Навасардян, бывшие конкурсанты Детского Евровидения - Маша Мнджоян (бэк-вокалистка на Детском Евровидении 2008 и участница национального отбора того же года, а также участница Новой Волны 2013) и Сона Гюлхасян (участница отборов 2010 и 2011 и Детской Новой Волны 2012), а также Анушик Тер-Гукасян и Кристина Мангасарян. Говоря о выборе участниц бэк-вокала, Лилит Навасардян благодарит всех исполнительниц, отмечая, что было довольно сложным отобрать подходящие голоса, поскольку некоторые части песня являются достаточно сложными для большинства певиц. "Песня LoveWave весьма экспериментальная, и это именно то, что мне в ней нравится. Эта волна выносит нас вне пространства и времени, оживляя нас. Я уверена, что наша песня придется по душе как зрителям, так и жюри конкурса" – говорит певица Анушик Тер-Гукасян. Маша Мнджоян отмечает, что песня LoveWave понравилась ей с первого прослушивания, запомнилась своей оригинальностью, добавляя: "LoveWave очень мощная песня, а сама Ивета - потрясающая певица. Я с нетерпением жду того, каким будет наш сценический номер". "Мне нравится, что эта песня является одновременно современной и этнической. Современные биты в ней прекрасно вписаны в традиционную армянскую мелодию. Ее инструментальная часть просто невероятна. Я никогда не думала, что армянская зурна может звучать столь мелодично", говорит Кристина Мангасарян. Сона Гюлхасян добавляет, что когда она впервые услышала песню, то смогла сказать только одно слово. "Я была невероятно обрадована решением Телевидения Армении отправить Ивету на Евровидение и, как и все, с нетерпением ожидала премьеры песни. Как только я услышала ее, то смогла произнести лишь одно слово - ВАУ!". "Нам поступили песни от всего мира - Швеции, Великобритании и Америки. Выбор был тяжелым, но в конце мы в нашей креативной команде отобрали две лучшие песни. Причина, почему LoveWave победила - в том что песня действительно затронула глубокие чувства во всех нас"
Гаспарян отмечает, что этот год является особенным для Армении на Евровидении-2016 в плане подготовительных процессов внутри Первого канала Армении. "Мы с точностью поднимаем уровень качества продукта, работая с лучшими профессионалами в Европе. Наш режиссер Арамаис сотрудничал с немецкой продюсерской компанией BlackSheep Communications чтобы создать вовлекающий в себя образ музыкального клипа," - говорит Гаспарян. LoveWave был признан как один из самых невероятно отредактированных технически аккуратных музыкальных клипов этого года. "Мы бы хотели особо отметить нашу большую трудолюбивую команду наших проект-менеджеров из Германии и Англии. Мы бы особо хотели отблагодарить нашего армянского проект-менеджера Мартина Мурадяна, который базируется и работал на нас из Великобритании; он настолько профессионально поддерживал нас на нашем пресс-туре и сблизил нас с Европой и Англией, обеспечивая наш комфорт и удачное выступлении на самом конкурсе. Мы готовимся к кое-чему невероятному в следующем месяце в Стокгольме! Не пропустите!" Мурадян ранее работал на Детском Евровидениии 2014 и 2015 годах (3е и 2е места), как разработчик проекта. Насчет Армении, как фаворита букмекеров в этом году, Гаспарян комментирует: "Мы не хотим предсказывать что-либо, но мы очень почтены быть в топ-5 стран которые могут действительно выиграть Евровидение-2016". Сегодня телевидение Армении раскрыло некоторые детали и опубликовало закулисные фотографии со съемок посткарда Армении для Евровидения 2016. В этом году открытки представляют артистов и их страны, в то же время подчеркивая как национальные традиции стран, так и хобби и интересы самих артистов. "Концепция этого года достаточно уникальная. Мы стараемся представить страну через ее артиста - его хобби, интересы и т.д. Мы используем различные кадры для того, чтобы сделать посткарды еще более красивыми", рассказывает режиссер Оливер Мартин - "Мы отлично провели время в Армении. Столица - очень красивый город, люди в нем очень добрые и гостеприимные. Работать с Иветой - одно удовольствие. Она очень профессиональная и креативна. Думаю, что посткард будет выглядеть потрясающе". Видео материалы со съемки открытки вы можете увидеть в дневнике Евровидения. Официальное lyric video на песню Армении "LoveWave" теперь доступно на официальном Youtube канале Иветы. "LoveWave" написали Лилит Навасардян и Левон Навасардян. Текст песни написали Ивета Мукучян и Стефани Кратчфилд. "Мы получили свыше 300 песен для конкурса, я сама написала 4 из них. Но как только я услышала эту композицию, я поняла, что это именно то, что надо. Не было никаких сомнений. Мелодия песни напомнила мне о волнах - больших, красивых, мощных. Она растет, становится больше и больше, и в конце концов взрывается и успокаивается в один момент, готовясь подняться снова. В первой части текста есть предложение, которое на мой взгляд описывает песню лучше всего: "Как будто я вышла из пространства и времени и ожила"
Соавтор текста Стефани Кратчфилд говорит: "Было весьма непросто написать текст на такую необычную песню. И именно это послужило вдохновением мне и Ивете. Мы не хотели сделать что-то стандартное, что мог бы ожидать каждый. Ивета подана нам идею "LoveWave", что, кстати, является настоящим научным термином, который описывает первую волну землетрясения. Нам так понравилась эта идея, что мы немедленно сделали это основной концепцией песни. Ее текст пытается заставить людей понять, что каждый человек, каждый момент важен. Каждый момент играет свою роль. Наше самое сильное вдохновение и оружие для создания изменений к лучшему есть и всегда будет - любовь"
Ивета Мукучян представит Армению на Евровидении 2016 со своей глубоко эмоциональной песней "LoveWave". Она основана на внутреннем мире певицы и ее собственных эмоциях. Премьера песни прошла сегодня на www.eurovision.tv. Видеоклип на песню - художественно абстрактен. Мы видим эмоции вместо действий, где раскрывается внутренний мир и внутренняя борьба персонажей, которая происходит не по написанному сценарию. Специально сделанные для клипа макро-съемки, используются для создания "картинки" химии, стоящей в основе чувства, которое охватывает все тело. Видеоклип стал результатом сотрудничества между AMPTV и немецкой компанией "BLACKSHEEP communications". Помимо Иветы Мукучян в нем снялся швед Бен Далхаус, проживающий в Германии и известный своим сотрудничеством в качестве топ-модели с крупнейшими мировыми брендами. Аутентичный внешний вид в видеоклипе создала Аревик Симонян, основатель и главный дизайнер бренда "Kivera Naynomis". Во время Евровидения 2016 Ивета Мукучян будет сотрудничать с известным армянским домом моды - "Kivera Naynomis". Потрясающие костюмы Иветы для Евровидения создаст Аревик Симонян - основатель и главный дизайнер "Kivera Naynomis". "Kivera Naynomis" создаст не только костюмы для выступления Иветы на сцене, но и еще несколько специальных нарядов для официальных церемоний и мероприятий. Они уже создали целую коллекцию одежды специально для Иветы, которая была использована в официальном видеоклипе на песню "LoveWave", которую Ивета исполнит на Евровидении 2016. Ивета уже не первый раз сотрудничает с "Kivera Naynomis". Еще в 2013 году она была одним из лиц "Красной коллекции" этого бренда. Основатель и главный дизайнер Аревик Симонян говорит, что она счастлива работать вместе с Иветой. "Ивета - настоящее олицетворение всех основных ценностей нашего бренда: сильная, женственная, красивая. Она харизматична, талантлива и переполнена позитивной энергией. Я по-настоящему счастлива работать с Иветой. Она - потрясающая артистка и невероятный человек", говорит Аревик. Официальный видеоклип "LoveWave" будет представлен публике 2го марта. Ивета Мукучян, представительница Армении на Евровидении 2016, посетила презентацию Polo Ральфа Лорана в рамках Нью-Йоркской недели моды. 25го сентября Общественное телевидение Армении объявило о том, что оно подтвердило участие в конкурсе Евровидение 2016 и опубликовало "загадочный" промо-ролик, приглашающий не пропустить оглашение представителя Армении на Евровидении 2016, и подчеркивая, что это сольная исполнительница. Вопрос о том, кто показан в видео обсуждался довольно длительное время, и позднее оказалось, что в ролике предстала не конкурсантка, а глава делегации Армении Гоар Гаспарян. Оглашение представительницы Армении состоялось 13 октября в 19:15 местного времени в рамках программы "Профессия - журналист". В тот же день Общественное Телевидение Армении объявило о старте конкурса для авторов песен, пригласив их подавать заявки на selection@armtv.com до 13 ноября. "Моя песня будет на английском языке, от средне- до быстротемповой, то есть не баллада. Мы считаем, что зрители хотят увидеть позитивное выступление. Ничего черного или темного не должно быть ни в стиле одежды, ни в номере, ни в песне или ее тексте. Мы бы хотели продолжить путь, начатый, например, Полиной Гагариной с композицией "A Million Voices", и представить на Евровидении такую песню, которая бы зажгла улыбку на лицах всех телезрителей. Самое важное для меня - это показать незабываемое выступление. Я хочу поделиться со всеми зрителями частичкой своего внутреннего мира. И это гораздо более важно, чем победа"
2го ноября Ивета опубликовала опрос, приглашая своих поклонников помочь в выборе наиболее подходящего жанра для ее выступления на Евровидении. За месяц, свыше 400 человек предпочли вариант Поп, 260 - вариант R&B и 85 - рок. "Все вы знаете, что не достаточно представлять себя и свою страну "просто" с хорошей песней! Разработка концепций, идей и написание песен за последний месяц, а также полученные заявки, все это звучит очень многообещающим для Евровидения! Наконец, я могу уснуть с улыбкой на лице. Из Армении в США, Норвегию, Германию, Швецию, затем в Эмираты... мы возвели эти прекрасные мосты, и я благодарна за всю потрясающую энергию и международное общение! Результатом этого процесса может стать только та ЛЮБОВЬ, которую я сохраню, и которая продолжит расти во мне, пока я не смогу поделиться ею со всем миром со сцены Евровидения! Потому, ребята, не волнуйтесь :) У нас все под контролем, чтобы представить Армению с наилучшей стороны, и я нахожусь в ожидании того момента, когда смогу поделиться всем этим с вами! Сегодня мы работали над еще одной прекрасной песней в студии hundert39 с Маркусом Брошем и Ови Якобсеном, который принимал участие в Евровидении 2010 и 2014. #горжусь #немогудождатьсякогдавыуслышите #музыка #командаиветы #командаармении #евровидениеАрмения2016 #студия #написаниепесни #авторпесни #поддержка #германия #армения"
В начале декабря Телевидение Армении объявило о получении около 300 песен из Швеции, Армении, Германии, США, Канады, Бельгии, России, Румынии и других стран. При этом, больше всего песен поступило из Швеции, а армянские авторы особенной активностью не отличились. "Мы выберем песню до НГ, и объявим эту хорошую новость", сообщила в интервью news.am глава делегации Гоар Гаспарян. "На новогодней сцене АрмТв выступит и Ивета. Мы придумаем интересное и красивое шоу для нее, в зависимости от того, какую песню она там споет, мы готовим сюрприз", добавила Гоар. 31го декабря в интервью Eurovision.tv Ивета Мукучян подтвердила, что ее песня уже была выбрана. "Мы получили заявки из Канады, США, Швеции, Армении, Германии - почти отовсюду! Песни были просто потрясающими, и было очень сложным сделать выбор". В конце-концов, выбор проводился между двумя песнями - одной, написанной шведскими авторами, и другой - от армянских авторов. Какая же победила? "Та, что смогла коснуться моего сердца. Я даже не предполагала, что песня может меня так тронуть", объясняет она. "Всех ждет двойной сюрприз, потому что мы хотим презентовать песню вместе с видеоклипом на нее". В новогоднем шоу на Телевидении Армении Ивета исполнила песню "Diamonds are a girl's best friend". 19го февраля было объявлено о том, что песня "LoveWave", написанная Лилит и Левоном Навасардян, Иветой Мукучян и Стефани Кратчфилд была выбрана для участия в конкурсе. Look, I know it might sound strange but suddenly I'm not the same I used to be. Spread a lovewave 'n my heart goes ba-ba-da-bu-who-oh-oh. It's taking, it's taking over me.